Kate attended the 100 Women in Hedge Funds gala on Thursday… and then went shopping on Friday. First of all, it bugs me that Kate attends the 100WHF gala every year since she really does not belong anywhere near any accomplished woman ever, since she threw her life away for a ring. She has done nothing of merit with her life, yet she gets fawned all over and treated as something special, like she deserves to be in the same room as women who are banking executives at major institutions and directors of multimedia business groups. Having said that… Kate kind of has a reason to be there this year; the 100WHF is raising money for Action on Addiction, one of Kate’s charities. Of course, this type of gala event is the only way to get Kate to do anything for her charities, because all Kate wants to do is get dressed up and play princess without actually having to do any work. 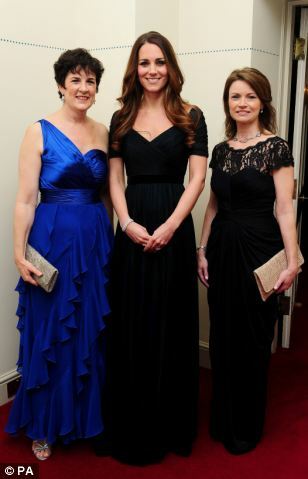 The gala was held in the state apartments in Kensington Palace, so Kate didn’t have to go very far to get there. Kate presented Dame Amelia Fawcett with the 100 Women in Hedge Funds’ 2013 European Industry Leadership Award. According to their website, “Each year, the organisation identifies a woman whose professional talent, business ethic, and passion for investing help define and advance the hedge fund industry’s standards of excellence.” And this year they chose to honor Amelia Fawcett: here is some information on her. I’d list some of the things she’s done, but damn there is a lot on that list. Now that is someone I’m envious of. Her list of chairman-this and director of-that is quite long and goes back a good two decades. Here is the 100 Women in Hedge Fund’s website. 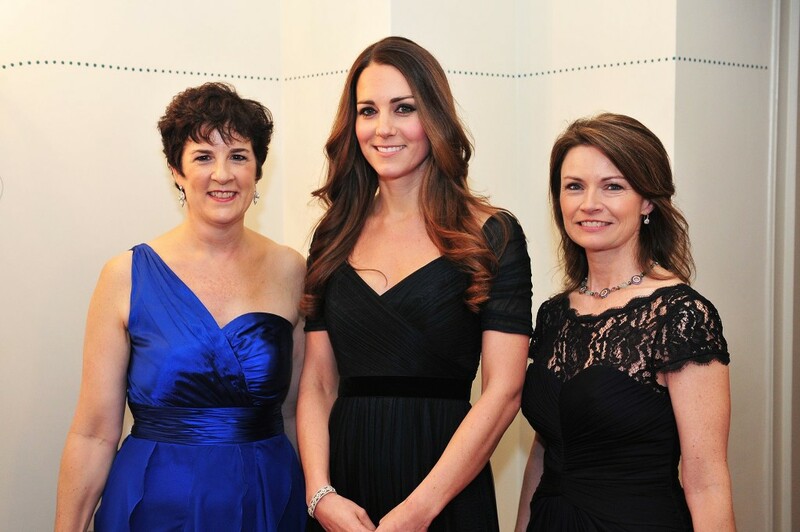 Amanda Pullinger, the 100WHF executive director, fawned all over Kate when she said: ‘We are honoured that the Duchess of Cambridge has once again lent her support to 100 Women in Hedge Funds for our London gala, and particularly as one of her first public appearances since the birth of her son.” Ugh. I kind of understand why they would be happy that Kate showed up, because Kate showing up means more attention will be paid to 100WHF, which is what they want. I just wish they would get someone who deserves to be there, who people care about and would draw attention to the organization without making it seem silly for the person to be there. Because, seriously 100 Women in Hedge funds… Kate Middleton? Let’s talk about fashion, since that’s all we can talk about with our Kate. 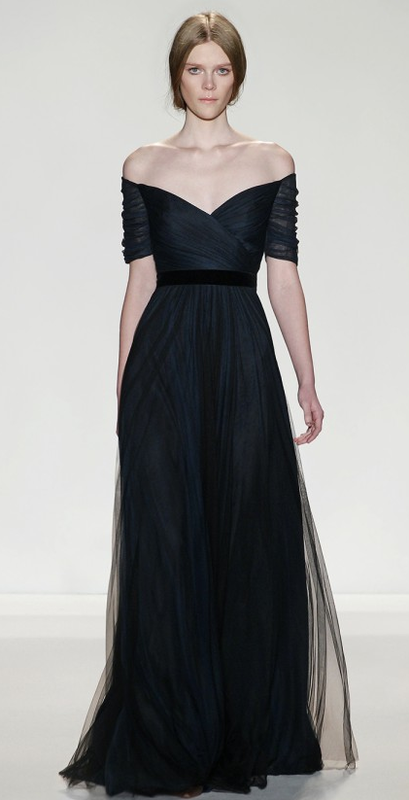 She wore a silk tulle floor-length Jenny Packham gown, which I originally thought was black but apparently is an ink blue. It was shown as off-the-shoulder on the runway, but Kate wore it with the sleeves covering her shoulders. I prefer it with the sleeve off the shoulder but I understand why Kate couldn’t wear it like that. I like the dress, it’s actually quite pretty. Keeping on the fashion tip, I want to point out Mimi Keller Drake (chairman of 100WHF), she’s on the right in this photo. She looks fabulous, I love her dress and the styling is wonderful. Here is a close-up photo. As for Amanda Pullinger’s dress (she’s on the left)… I’m not a fan. The color is great, but I don’t like the dress as a whole, and it’s too short on her. For what it’s worth, William and Harry are also patrons of 100 Women in Hedge Funds’ philanthropic initiatives. And what did our precious Kate Middleton do after an exhausting night getting dressed up and playing princess for 100WHF? She went shopping!!!!! Here are some photos of Kate shopping on Friday. Why is she wearing such heavy make-up for a shipping trip? I love how they say Kate went shopping with a male “friend”… LOL, Kate does not have any friends, that’s her bodyguard. I would like to draw your attention royal gossip psychotic website. has a lot of facts. This article speaks volumes about waity’s character. Sorry to sound harsh, this lazy woman is the worst social climber of the century, useless, useless!!! !